Thinking of cycling Mont Ventoux? 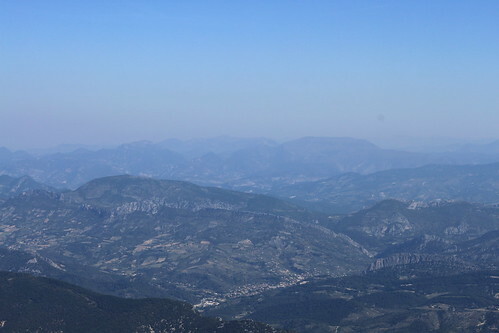 Camilla Brokking-Maltas climbed the Giant of Provence for charity. Here are her top 10 tips. Ventoux planning advice and support - let me help you! I've long had my eye on cycling Ventoux. Up until last year, it still seemed like a unlikely dream. Then my husband enrolled for Alpe d'HuZes, a charity bike ride for cancer research, and I decided to cycle Alpe d'Huez myself. It was a slow and painful bike ride, but it ignited in me a desire to challenge myself. I wanted to ride Ventoux. The ride offered me the opportunity to raise funds for Alzheimer's research. My grandfather, David Sommerville, passed away in 2003 after over a decade with Alzheimer's, and my favourite author, Sir Terry Pratchett, had recently announced his own diagnosis, so it was something I felt strongly about. The Lilac to Ventoux bike ride was born, and I set the date: May 25, 2011. Even from a distance, Ventoux dominates the landscape. As we approached Bédoin, I wondered whether I had bitten off more than I could chew. I wouldn't chicken out, though. Whether I thought I could reach the summit or not, I was going to get on my bike and give it my best shot. By the morning of the 25th, I felt less afraid, and more excited. When I left at 5.45am, the sky was clear, it was cool, and there wasn't any wind at all. Aside from one other cyclist far ahead, I was alone on the road. Perfect conditions to get my head down and find my rhythm. It was a damned hard bike ride. I averaged only 5kph, and had to stop often to have a drink and a breather. The climb was a great lesson for me in patience, self-control and determination. It helped to have my husband and son as my support crew, cheering me on. I had also taped a list of names to my crossbar - my Grandpa, Sir Terry, and all my sponsors. Seeing those names every time I looked down was the reminder I needed to keep pedalling. I still find it hard to believe that, one pedal stroke after the other, one breath after the other, I climbed one of the toughest mountains in France by bike. It was physically and psychologically challenging, but also one of the most rewarding experiences I've ever had. 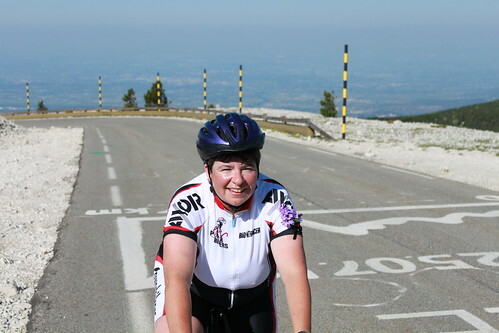 Thinking of taking on Ventoux yourself? Here are 10 things I learned along the way. There is an enormous amount of information available on the internet about cycling Mont Ventoux, including technical data and advice; Climb by Bike is very helpful. Searching for 'cycling mont ventoux' will yield many inspiring personal stories. IGN has an excellent Mont Ventoux map. This might seem like stating the bleeding obvious, but you need to do some serious kilometres to make it up Ventoux on a bike. I cycled about 2500km to prepare, and it didn't feel like enough. Make sure you include hills. I didn't do anywhere near enough hill training, and it showed. Also, wear a heart monitor to learn how your body responds to hard work (and stress). Make sure you eat and drink properly before and during your Ventoux bike ride. Even if you leave early in the morning, climbing Ventoux is thirsty work. Chalet Reynard, six kilometres below the summit, provides you with an opportunity for refills. I think I ended up drinking two litres, and I was heartily sick of energy bars by the end. 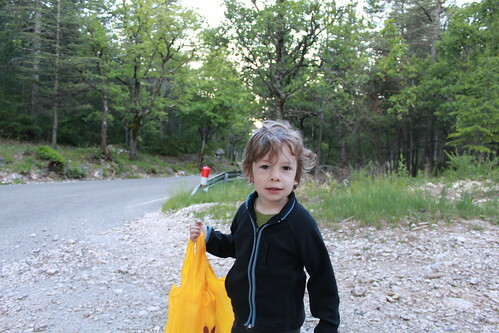 We drove to the summit of Ventoux from Bédoin a couple of days before my bike ride to get an idea of what was to come. On a test bike ride (the first six kilometres), I worked out what gear to use and the best pedal/breathing rhythm. We saw people starting out on their cycle rides in the middle of the day; this seems like utter madness considering how hot it can get this time of year (I cycled in May). Leaving as early as possible will give you the advantages of the cool morning air and a quiet road. This was a huge challenge for me, but it's essential. Pick a low enough gear on your bike that keeps you moving at a comfortable pace, and don't push too hard. Wear a heart monitor, and take rest stops if you need to. When toiling up an unrelenting incline, there's nothing quite so cheering as a three-year-old shouting "Hup, Mama, hup!" and waving a supply bag. Having my husband and son along was great for my determination, and it also meant I didn't have to carry as much food and drink on the bike. I gave no thought at all to the bike ride back down. That was a mistake. I am a chicken when it comes to speed, and there is no avoiding speed on the way down. I didn't dare go fast, and braking constantly heated my bike wheel rims so much that my rear tyre blew out, ending my ride prematurely. Include descents in your training! 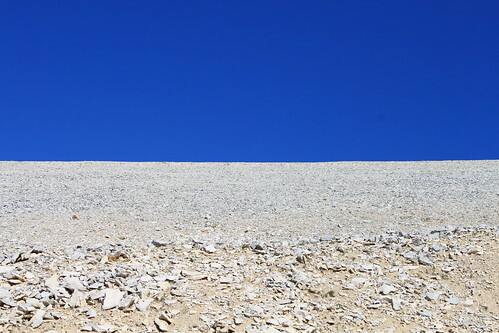 Don't forget to enjoy the view from the top of Ventoux! Camilla Brokking-Maltas was first introduced to the wonderful world of bikes by her father in the early 1970s, and has been a keen cyclist ever since. Originally from Zimbabwe and then Australia, she now lives in Belgium wth her husband Arnout and son Emrys, and spends her free time cycling around beautiful (flat) Limburg and dreaming about mountains. She plans to do something foolhardy on a bike every year to benefit Alzheimer's research. The IGN map of the area surrounding Ventoux is a worthwhile addition to your bike pannier (UK, Fr). There is also a broader map that takes in the Vaucluse department beyond Ventoux. For those interested in the Tour de France, Willliam Fotheringham's Put Me Back On My Bike: In Search of Tom Simpson (UK, US) is the haunting story of arguably Britain's finest ever cyclist, and one whose memorial sits on Ventoux near the spot where he died. Tom Simpson's own autobiography was re-released by Yellow Jersey Press in 2009. Simpson's nephew, the cycling author Chris Sidwells, has also written about Simpson. Sidwells, who wrote A Race for Madmen (UK, US), is also the author of Tour Climbs: The Complete Guide to Every Tour de France Mountain (UK, US) – see how Ventoux stacks up against other famous Tour de France mountains. On a lighter note, Tim Moore cycles Ventoux in French Revolutions: Cycling the Tour de France (UK, US). For more great books, see our must-read Tour books. 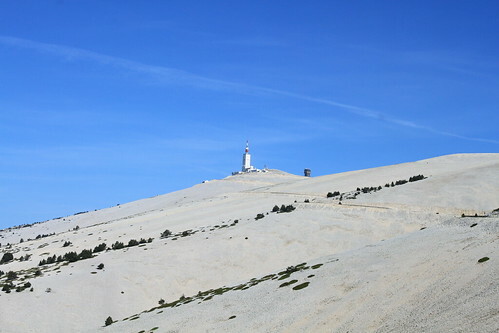 If you need more help making up Ventoux by bike, see Stephen Lord's climbing mountain passes. Paul Henderson, meanwhile, has done the maths for Freewheeling France to see how Ventoux stacks up against other famous Tour de France climbs. See Cycling Ventoux from Crillon le Brave for other bike rides in the area (handy for your support crew or friends and family if they're not taking on the mountain). See our bespoke bike hire service if you need Ventoux rental. Check here for links to accommodation in France, including hotels, gîtes, gîtes d’étapes, B&Bs, self-catered and campsite options, or zoom into the map below. There are many companies offering organised rides up Ventoux. Some are guided and fully supported, while others are self-guided and come with pre-arranged accommodation, maps and on-ground support and advice. High-spec bike hire can usually also be arranged through your tour company. I have this bespoke service to help you find the best Ventoux cycling tour for you.